Our Vietnam experts love to tailor each honeymoon to suit your interests, budget and timescale but we have also crafted a diverse range of private Vietnam honeymoon itinerary to inspire you. Vietnam will seduce you with its colorful culture, mouth-watering cuisine, beaches, colonial charm and stunning landscapes. This tour is filled with additional special touches to make your romantic Vietnam honeymoon itinerary during 5 days, which you will never forget. Don’t worry about the best time you can visit Northern Vietnam because the weather in here is very convenient for travellers with three good seasons like winter, spring and summer. Each of seasons has the different highlight of three destinations – Vietnam highlights tour. Therefore, you should search the information about weather during the trip to bring the suitable clothes. After landing at Noi Bai airport, you start at the Ho Chi Minh Complex where you will see the Presidential Palace, the One Pillar Pagoda and the Mausoleum are the resting place of Vietnam’s founding president. Then in the afternoon, you continue taking a cyclo to discover the Hanoi Old Quarter, which provides the old-style narrow streets and houses, the colorful souvenir shops for you. The couple also visit Hoan Kiem Lake situated inside a complex of Ngọc Son Temple, The Huc Bridge, and Pen Tower in the surroundings that you can grace a sparkling colorful natural picture. We recommend you to eat “Bun Cha” which is the vivid combination of mouthwatering grilled pork, noodle, and tastefully sweet spicy sauce. Finally, you can finish up with a coffee in a local café. The temperature of Sapa is the lowest in Northern area. After leaving Hanoi capital, you should bring a jacket to trek the hills. High recommendation for you is checking in at Dragon hotel in Sapa and enjoying coffee in Baguette & Chocolat Cafe. Winding through hilly terrain and past terraced paddy fields, the road from Sapa takes you to Cat Cat village, just 2km from the town. Moreover, nowadays, this village is built and developed to be Cat Cat tourist area, which is a traditional destination for everyone. You will visit the biggest valley which offers to the beautiful views of the golden rice terrace field in Vietnam. The walk takes you from Lao Chai village of the Black H’mong minority to Ta Van village of the Giay minority with a stop at the local Catholic Church en route back to Sapa. It is a small group of ethnic people living in Vietnam, they still preserve a rich and traditional culture. The famous villages are missed in Vietnam honeymoon itinerary. On the second day, let’s continue your walk through rice paddy fields and spectacular scenery to Ma tra. Ending your way at Ta Phin village where Black H’mong and Red Dao lives in harmony for generations. Transfer to Lao Cai station and catch up the train to Hanoi. Depart Hanoi and drive about four hours to reach the UNESCO World Heritage Site of Halong Bay. To get the romantic Vietnam honeymoon itinerary, you spend the next few days cruising on the jade waters, admiring the sublime landscape of limestone karsts aboard a traditional junk boat. You can grace Halong Bay from above by seaplane, it is very romantic. Check in the luxury cruise to overnight. This is the best time for visiting the most beautiful islands of Halong Bay with funny names such as Dog, fighting chickens and incense burner. Besides, almost of travelers are persuaded by the beauty of famous caves. You will discover a number of famous landmarks such as Sung Sot cave, Thien Cung Cave, and Dau Go Cave which are the most beautiful caves of Halong Bay. In the first evening, you should join to some activities on the cruise such as squid fishing, watching movies, or karaoke. In the next day, after finishing the breakfast in your cruise, the couple will continue discovering other islands. One of the most satisfying things to do in Halong Bay in Vietnam honeymoon itinerary is sunbathing or swimming which brings the advantages for your skin. Besides, the other special water sports are diving and kayaking. To get the deep experience quiet atmosphere on the beaches in the honeymoon, trekking the Peak of Limestone Island and cycling around the area will become great things to do for tourists. 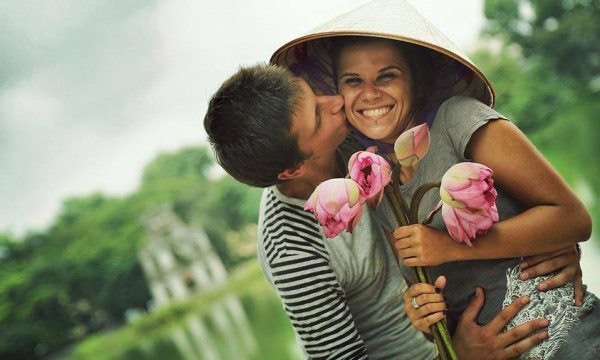 What is the best Vietnam honeymoon tour? What Are the Detailed 7 Days Itinerary North Vietnam?